LinkedIn, Twitter, Google +, Facebook, conferences, journals, and more continue to come across our desks as ways to do professional development. (See previous blog on this topic). So how do we manage all this information? I found that there are key people out there writing about topics meaningful to me and that if I follow these key people, they will either sift through the volumes of topics and synthesize for me or they write topics I am interested in. I also use feedly.com to organize various blogs & news I want to follow. This is an aggregator application which compiles news feeds from a variety of online sources. I have three categories, CAREER, NEWS, and SOCIAL MEDIA. I can then add people / organizations that I want to follow under each category. Currently I follow two news feeds, one social media marketing feed, and six career feeds. This does NOT have to be overwhelming. Keep it simple. Less is best. Based upon the input I received in a different LinkedIn groups, I’ve actually added a couple to my feed. can skim the list and if there is something that looks interesting, I read it. If I like it, I share it on LinkedIn or PeakCareers Facebook, or Twitter. This allows me to manage my time and if I had all of these coming into my email I would be overwhelmed. If I had to actually go out to each person/organizations site, I would never go. Here is my list of bloggers I follow. One of my favorites is Bob McIntosh, “Things Career Related” who blogs quite a bit on using LinkedIn, some great tips for introverts, and more. He’s practical and offers great tips and advice. Careerealism is robust. They post 3 or 4 articles each day on a variety of topics from a variety of bloggers. Their tag line is “Because every job is temporary”. In 2013 they published over 2000 articles. Here is their Top 10 list if you’d like to get a feel for them. 2013 Top 10. Lindsey Pollak blogs occasionally and is LinkedIn’s representative to career professionals. She is an expert on working with Millennials and has written on the multigenerational workforce as well. Lindsey’s Blog. Rebecca Fraser-Thill is a career coach who focuses on working with college age people who need help “figuring it out”. Her blogs are insightful and offer practical advice for all ages. I have found myself commenting on her blogs occasionally which is a good sign that you are engaged in her blog. BLOG. e-mail me for a copy of my May 2014 newsletter. Who do you like for bloggers? 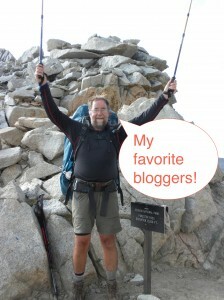 I do not or have not followed any bloggers! No reason, just there has not been a need as I deal with science sites and sources. Yours caught my attention in a recent post on LinkedIn though, so I thought I would take your directions and look. I like reading other peoples thoughts as a way to continue learning. Sometimes another person will present something in a slightly different way and I realize that I could modify how I explain things or do things when working with others to make it better.